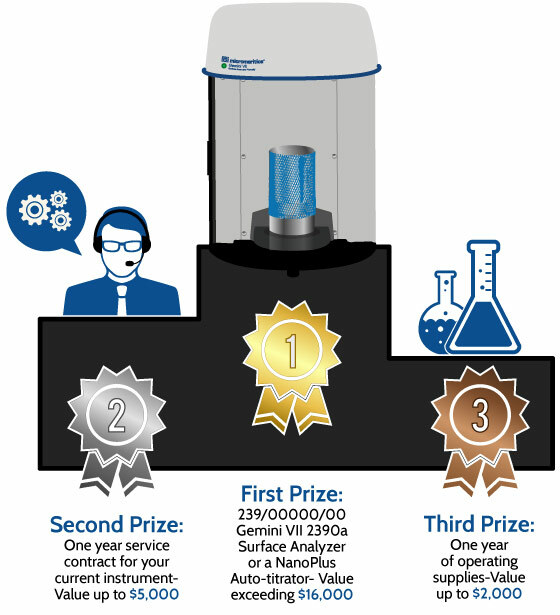 Submit your personal story about how Micromeritics/Particulate Systems has helped you accomplish, improve or make a difference in your laboratory and be entered to win a fabulous prize! We are looking for the greatest stories ever told about our involvement doing what we do best, improving the life in the lab of our valued customers. Tell us in your own words what you have experienced. Be as quantitative as you can with facts, figures, images and graphs to help illustrate your experience and gain you extra points in our evaluation of the stories we receive. as our thank you for participating! Void where prohibited by law or company policy. One submission per contributor. Minimum of 400 words required for consideration. Contest will be null and void if the minimums 100 submissions are not received. Contest begins Nov 15th. All submissions must be received by January 31, 2016. All submissions will be reviewed by the marketing manager at Micromeritics for content, originality, importance or impact to the lab, and completeness of supporting materials and proof statements. Content submitted becomes full ownership of Micromeritics Instrument Corp and author relinquishes ownership and copyright at submission. Materials submitted may be used for promotional or sales purposes by Micromeritics at its sole discretion. Awards will be distributed February 15, 2016. Winners will be notified by their contact details via phone and email.